Alright, nobody panic (insert Steve Carell office gif), it’s only one game and it’s the pre-season. But, man is it good to have New York Knicks basketball back. When I say “back,” I mean just watching basketball. It’s going to take a few years until the Knicks are hopefully back back. However, I don’t know if we will agree with that statement come mid-season when the Knicks are 12-30, so let’s be optimistic. 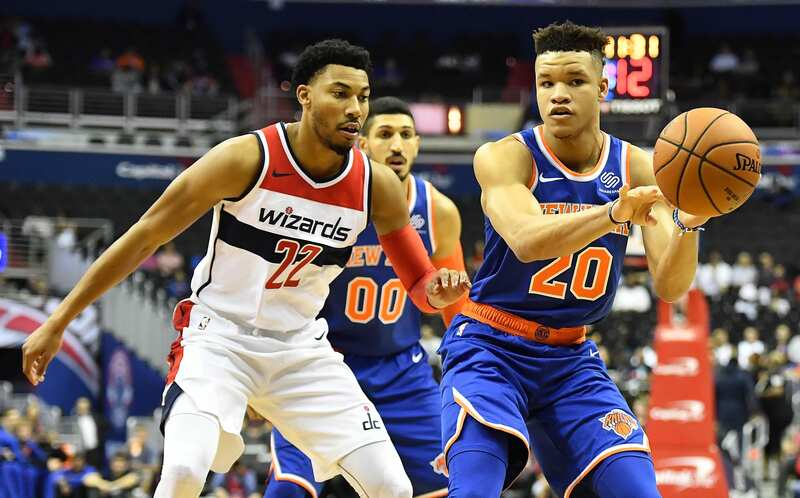 Besides kicking off the Fizdale era with a 124-121 OT win over the Wizards, last night gave us some glimpses into the future of what Knicks basketball could look like. We’ll kick things off with the starting lineup, Burke, Hardaway, Knox, Thomas and Kanter was what we all figured. Burke has earned that spot and deserves, yet another chance, to be a starting point guard in the league. He displayed some smooth ball-handling and ability to create while knocking down a few jumpers. Burke’s mid-range is his bread-and-butter, which Fizdale loves. Burke did miss a lot of reads on offense which needs to be addressed. However, Burke is not the long-term solution, Frank is. Burke will be playing for a contract, so expect him to have a decent year, then it’s Frank’s team. Next, our first-round draft pick, Kevin Knox. Knox ended up with a double-double, 13 points, 10 boards. He already looked like he’s been in the league for 2-3 years. Knox look comfortable and I saw similarities to Celtics’ Jayson Tatum. Just from his first game, Knox can easily average 20 points a game this season. And that was with his 3-point shot not falling in the first half. There’s so much to go into for the first pre-season game, so we’ll try to hit the main points. Of course, everyone played. Some of the players we were most excited to see, besides Knox, was 2nd-round pick Mitchell Robinson, Frank Ntilikina, Noah Vonleh, Allonzo Trier, Emmanuel Mudiay and Damyean Dotson, to name a few. One of the most intriguing players Knicks fans wanted to see was Emmanuel Mudiay. It was reported over the off-season Fizdale really likes his game. We were hoping Fiz can bring out the potential in Mudiay, but last night we saw the complete opposite. Mudiay doesn’t do much on the court. He can’t shoot, he can’t get to the hoop, and he can’t create. It was the pre-season opener for crying out loud, but he needs to show something, otherwise that trade will be another bust. Our 2nd-round pick, Mitchell Robinson is going to be good. I love his athletic ability and his size. He needs to put on some muscle, but besides that, put the rock in the air and say “Go get it Mitchell.” Robinson has what it takes to be a tremendous two-way player. The one series he had the lob dunk then came down on defense and had a block. That’s what Fiz needs to build on. Also, Fizdale loves his toughness and how he didn’t back down to that punk Markieff Morris. Both were trash talking all game, but our rookie didn’t let him get the best of him. Let’s just hope he isn’t a hot head, but he kept his cool last night regardless. As for the rest of the crew, Frank didn’t play as much as he should have. He was aggressive, but needs to take his shot more. Frank is our future point guard, but his offensive game needs to continue developing. Damyean Dotson came alive at the end of the game. However, we’ve seen that story before. Do it in the season Dotson, and be consistent. Noah Vonleh could be good and a valuable asset down the stretch. He has size and the ability create and muscle people. Vonleh will be one he border for making the team, so he’ll need to step it up. Finally, Allonzo Trier. Besides Robinson being a possible steal, Trier could also be another one. He has the capabilities to be a valuable offensive stud off the bench, which was on display last night. When Trier was in the zone last night, he was shakin-n-bakin and showed what he could bring to the team, offensive promise. Overall, we should be excited from what we saw last night. It was only one game in the pre-season, but there was a lot of good things that were seen from our draft picks and younger players. There were also numerous things to build on. We don’t expect the Knicks to be a playoff team, but as long as we’re taking a step forward instead of back, Knicks fans should be optimistic about the future.